This post was written as a personal response to a great piece on Food52. As well as the larger discussion of health and nutrition that I think about every day and often feel guilty for avoiding with clients. As a personal chef I both need to and enjoy research on food and nutrition, but I have yet to find a way to talk about it with others that doesn't feel like I myself am dictating what they should eat. My hope is that soon we will all be able to celebrate nutrition, health, moderation, decadence, individuality/creativity in food, and the end of scare-tactic-click-bait writing when it comes to food. Lamb and Olive Ragu with Meyer Lemon sauce & Sprouts. My family prefers dinners where the protein is the star but love when it is brightened up with citrus and/or greens. Can't the simple act of eating a homemade meal around a table together make a dish more healthful? Healthy. It seems like such a straightforward word. But, with sincerest apologies, we need to re-define it or better yet ditch it altogether when it comes to our food and bodies. At this moment in time it only means anything to food labelers at the FDA. Often, healthy is used only to sell foodstuffs to busy, concerned consumers. Too often, healthy is used as an excuse to replace naturally occurring sugars and fats with chemical and artificial ingredients. Far too often, healthy is promised “if you just never eat this one food ever again because seriously you’ll lose 40 pounds and it will definitely give you cancer”. A restrictive and/or prescriptive diet is rarely fully nutritious, and it’s definitely never fun. Foods that are nutritious, on the other hand, can be played with like art class. Oh, so dark green vegetables have lots of vitamins and minerals but many of those vitamins and minerals can only be absorbed through fat? Awesome, let’s mix them together! I’ll have a small salad of spinach and watercress with an avocado oil vinaigrette please. Add some crispy shards of chicken skin and roasted nuts for texture. Plus maybe throw in a soft boiled egg for protein. To finish, just a few shaves of parmesan to round out the flavor. Voila. Decadent (AND nutritious!) in moderation. That salad would be filling, fulfilling and nutritious, but no one would ever put it down in the dictionary as “healthy” no matter what the portion size or calorie count ended up being. While rewatching the first season of Chef’s Table on Netflix the other day I was struck by something Dan Barber said. And this realization is somewhat miraculous since I almost didn’t rewatch that episode; I assumed I understood farm-to-table well enough. But beyond that now passe term I realized his focus is actually the crop-land-cuisine relationship and making all three sides of that triangle more nutritious. Barber pointed out that the “Cuisine” of the United States has never been nutritious or interesting when compared to others from around the world because we have never needed to coax the food out of the land. We are blessed to live in a country whose very soil seems to want to grow nutritious and delicious food, even after the many wrongs we are continually realizing we have done to that soil. (For immediate contrast, I cried at the beauty of Patagonia and the poetry of cooking a fish you had just caught, packing it with the clay-mud surrounding the lake you caught it from, in a fire pit on the shore: one of many moving tableaus during in the following episode profiling Francis Mallmann.) Thus, we have never had to figure out how to get creative with what the land provides just to continue living. Constraints, after all, are the soul of creativity. Above all else this is what I will always remember from college, thanks, Donald! 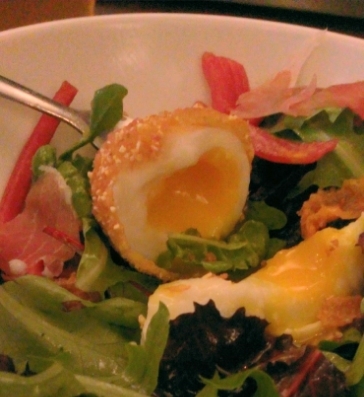 A 6-minute scotch egg and pickled radishes atop a salad whose vinaigrette was made with schmaltz as the fat. This was one of the most surprising and delightful dishes I've ever had at any restaurant as well as one of the most filling salads. Going back somewhat the title of this rant, “All things in moderation” and other variants of this platitude have been used in many ways by many people to attempt to counteract fad diets and hysteria over the “evil” butter, eggs, and various other foodstuffs that have been blithely demonized in their own time to be replaced with unpronounceable ingredients. You can call me a privileged millennial if you like but I am perfectly happy to have been born in 1989. Among other things this meant that when I was 12 people no longer talked about said butter and eggs like they were the devil. I became a vegetarian at that age and while I liked fruit/vegetables then and thought I had a varied diet, in comparison to how I eat now my diet then was almost solely eggs and variants of bread-and-butter-and-cheese, and not in moderation let me assure you. And yet, adjudged by media-created expectations and standards my “healthiest” (read: skinniest) me was when I was a vegetarian. But of course I was skinny; I was a teenager. I played field hockey, had other after school activities and walked all over downtown daily to feel independent. I wasn’t eating healthy, I just had a teenage metabolism and used up calories slightly faster than I ingested them. I didn’t go vegetarian with the intention of being healthier or be part of some fad. I read Laurel's Kitchen and the Omnivore’s Dilemma and decided that to be a better resident of the earth it would be more productive for me to get my energy from the grains and grasses directly instead of eating ill-treated animals who had been fed the grains and grasses in my stead. Plus I really didn’t enjoy the flavor of grocery store chicken or beef and thought I HATED pork products (now many of my most requested meals from clients incorporate pork because I love cooking with it so much). So I assumed my tastebuds understood morality or some other teenaged nonsense when in fact farming practices had simply taken away all of the inherent flavor. Fast forward 15 years, and now there is a wonderful butcher shop in my smallish Virginia hometown and country-wide grocery store chains make some effort to stock animal products from humane and sustainable sources. That, combined with the fact that I realized wanderlust and vegetarianism are usually mutually exclusive meant that senior year of college I gradually added meat back into my diet. And let me tell you, not only is beef raised sustainably and locally better for the earth, it tastes better too! Virginia pasture raised cows eat some amazing Shenandoah Valley grass that adds a minerality to the taste of the meat. And that minerality makes me want to eat more green things alongside the meat because their crisp sweetness is a perfect balance. That is why I eat a diet best described as decadent and nutritious in moderation. I know that local, sustainable meat is not cost-effective for everyone, but it is fulfilling even in the smallest amounts. And I know that there are various other reasons people become vegetarian, vegan, etc. I work with my clients to figure out the best way to get them a varied diet inside their own constraints, but sometimes I really want to share my “decadent in moderation” philosophy with them because they seem not to enjoy their own food choices. Healthy, nutritious, sustainable, affordable and fast are hard to reconcile with each other, but I’m going to keep trying for myself, my family, and my clients, and I hope everyone who reads this thinks about what they have eaten recently and asks whether it made them happy and energized them. I was eating this plate while editing the post above. That's a bunch of romaine, two boneless chicken thighs with pesto dressing for dipping and a half pint of cherries. Very "healthy" looking AND factually nutritious (romaine, despite being fairly light in color is one of the most nutritionally dense greens) and yet because I was not paying any attention to eating, I felt was hungry/unsatisfied less than 2 hours later.